Need Items autographed and/or inscribed? You've come to the right place: let us know! 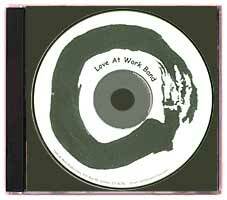 CDR - $10.00 s/h FREE!! 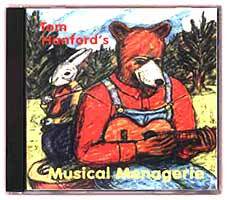 Original songs by Tom, Steve Bellwood and Kath Bloom and perennial favorites such as "Tingalayo", "Rocking Robin" and Waltzing with Bears" (sung with Puppeteer Grian MacGregor) Excellent supporting musicians. This CD has proven to be a big hit with kids and grownups. Love at Work (Tom Hanford, Kath Bloom, Stan Bronski and Fran Patnaude) present a rousing collection of songs interspersed with wacky comic skits. 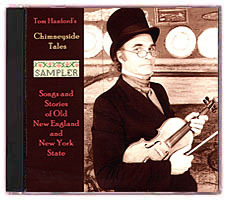 Ten songs by Kath, three by Tom and folk/popular material (including Woody Guthrie's "Come See", a Latin flavored "Hush, Little Baby" and "The Old Chisholm Trail". This collection of chants, singing games, dances, lullabies, humorous ditties, and just downright singable songs celebrates something that is not as common as it once was in the lives of Americans - the joy of homemade music. New Hampshire dance caller, Kathy Torrey, recorded the album a while back with the help of her young daughter, Linnet, and a handful of children and grown-ups singing and playing instruments (guitar, fiddle, keyboard, and pipes). The repertoire is traditional with a New England accent. Material is drawn from Anglo-Celtic, French Canadian, Native American and African American traditions. 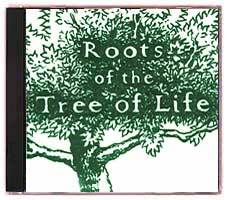 While "Roots..." does provide a glimpse of the kind of home entertainment that was more prevalent before the advent of home entertainment centers there is nothing self consciously presented about it, Quite obviously this is music that Kathy has known and loved for a long time, an integral part of her life that has been passed on to her and which she has passionately shared with her daughter and others. This is a delightful family album bursting with vitality and conviction. Get it so that you and your kids can learn to sing "Tread on my corns and tell me lies but don't feed me dried apple pies." T.H. "Live From Where? WPKN 89.5"
Recorded live at WPKN, Bridgeport, CT on March 16. 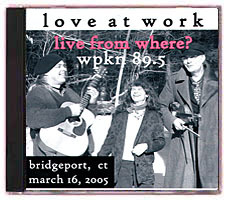 2005 as part of the station's "Live From Where?" concert series. Tom, Kath, Stan Bronski and Fran Patnaude present a rocking collection of original songs (many by Kath, some by Tom) and traditional songs. Vocals are supported by acoustic and electric guitars, stand-up bass, recorder, harmonicas and violin. 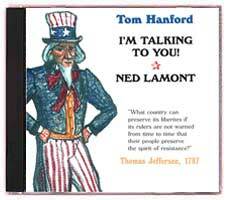 Ten Love songs by Tom Hanford and one by Kath Bloom. Memorable material supported by excellent musicians (see the friends page of this web site). A 14 minute promotional overview of Tom's historical show for children 6 years and older. Tom intersperses abbreviated version of traditional songs with commentary about the program. Available FREE to venues with an interest in the show; $5 plus postage for all others.